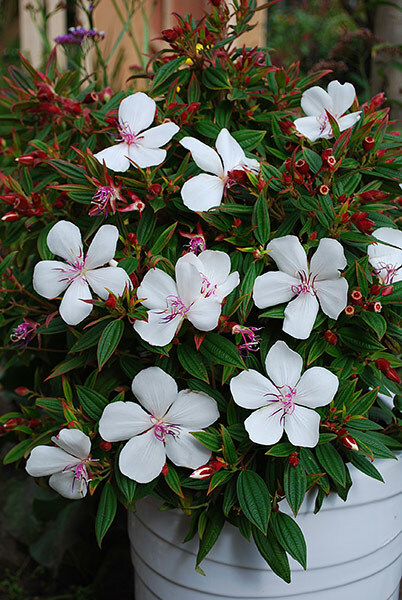 Tibouchina 'Peace Baby' is a member of the amazing Australian Tibouchina breeding program that produced the Fantasy Flower Collection. 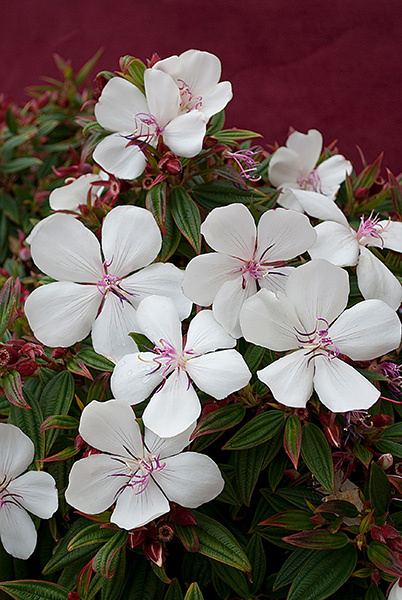 T. 'Peace Baby' is a compact variety that rewards with stunning large white flowers right throughout the warmer months. The blooms smoother the plant, creating a truly eye catching display. 'Peace Baby' was purpose bred to perform in both tropical and cool climatic zones. This means that those of us living in the cooler regions can also enjoy the beauty of tibouchinas, usually a sub tropical genus. 'Peace Baby' is extremely compact and very easy to grow. Peace Baby' grows well in most soil types that are well draining. Feed in early spring with a slow release fertiliser for best results. Create outstanding displays for containers and small gardens. Add the 'wow' factor to your entertainment area over summer. Works well in rockeries and mixed borders. Rewards with fast results, so a perfect choice for new gardens.